Farmers travel down the San Juan River, near their crops to verify the damage caused by Antinarcotics Police glyphosate fumigation in the area. Chocó, Colombia. 2013. 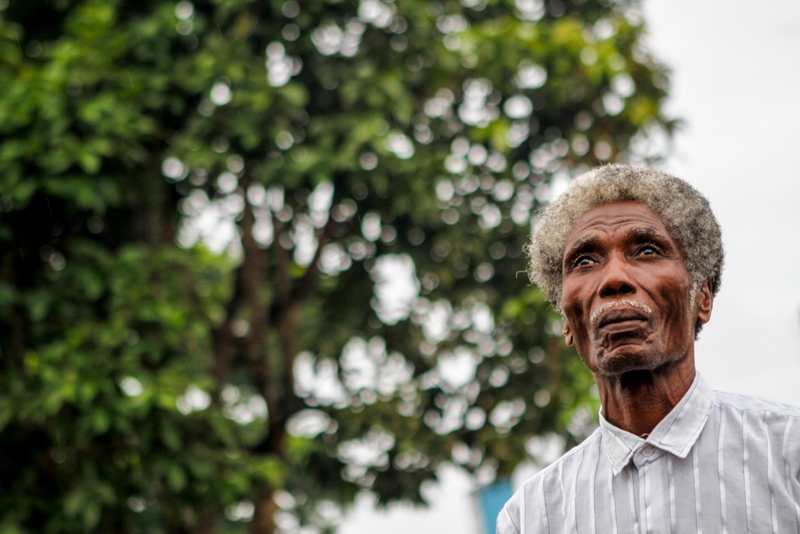 A resident of one of the many isolated villages that exist through the San Juan River in Chocó, Colombia. 2013. Farmer in the middle of one of their crops that has been damaged by glyphosate fumigation done by Antinarcotics Police in Bajo San Juan. Chocó, Colombia. 2011. Fast boats, canoes and "chalupas" the hand made canoes made by indigenous communities, are the only way of transportation to the villages of the Bajo San Juan. The boats transport people and goods, not always secure with heavy rains sometimes the villages have to wait days before goods arrive or are able to move to other places. Chocó, Colombia. 2013. The illegal gold mining that takes place in different places through the San Juan River. Chocó, Colombia. 2013. A member of the Colombian National Police is seen wearing a scarf that says, "Fear only in front of God". Chocó, Colombia. 2013. A man stands near a box of beers near the San Juan River. Many groceries such as beer are difficult to transport and distribute in the area. Chocó, Colombia. 2013. Many of the ELN fighters are from the region, though some middle and high command are from different parts of Colombia. Chocó, Colombia. 2013. 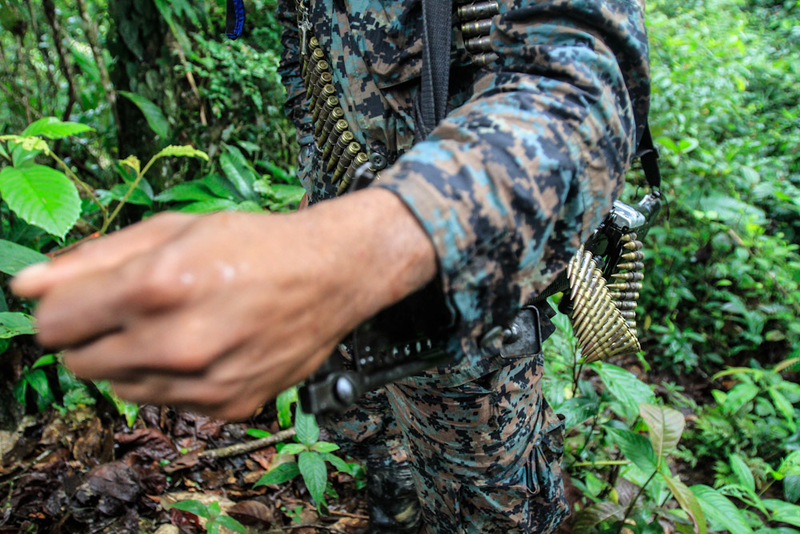 A member of the ELN guerrilla group in Chocó. ELN has seek lately a space for peace talks with the government of Colombia. Chocó, Colombia. 2013. An indigenous child, has an unidentified skin rash, the community thinks it has to do with the glyphosate fumigation that take place near their crops, in an attempt from the police to destroy coca plantation. Glyphosate has been banned in many countries due to its risk in the health of humans. Indigenous children walk in their village; many indigenous communities live in the area. 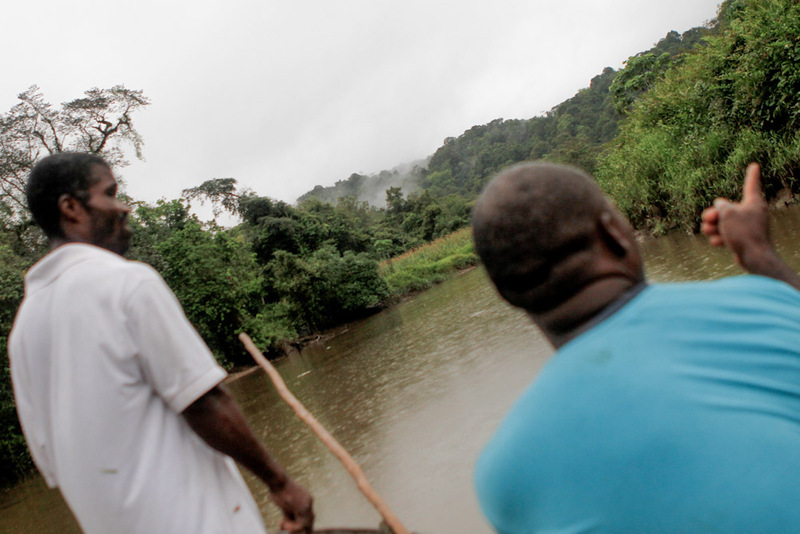 They only means of transportation are through the river; distances in canoes can last days until they reach villages with government, health and education institutions. Chocó, Colombia. 2013. Indigenous children play in their village; many indigenous communities live in the area. The area is so isolated that many of them don't speak very well Spanish. Chocó, Colombia. 2013. Heavy armed National Police members help a senior lady to go to a medical center the only one that exist for many kilometers of the San Juan River. Chocó, Colombia 2013. The shop owner of one of the few grocery shops in the villages from the San Juan River. A family walks in one of the few streets in a village of the San Juan River. Colombia. 2013. 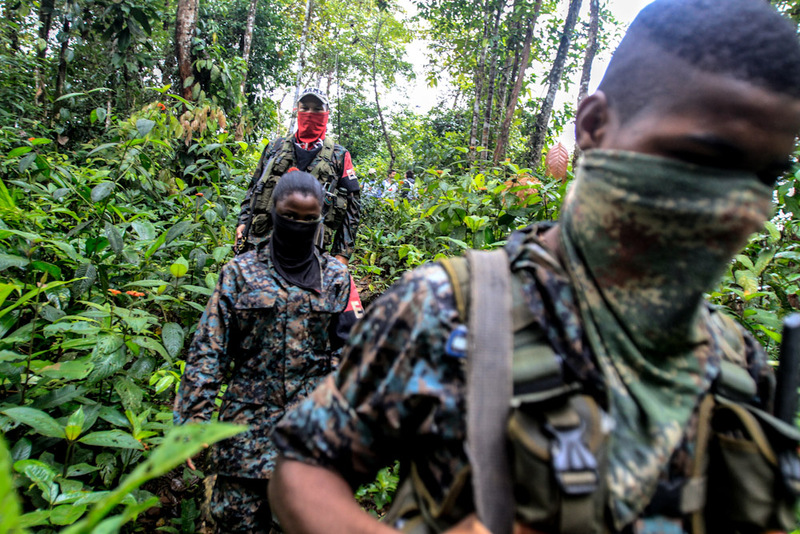 The ELN guerrilla group is the second largest group after the FARC guerrilla that is currently in a peace process with the Colombian government. Chocó, Colombia. 2013. 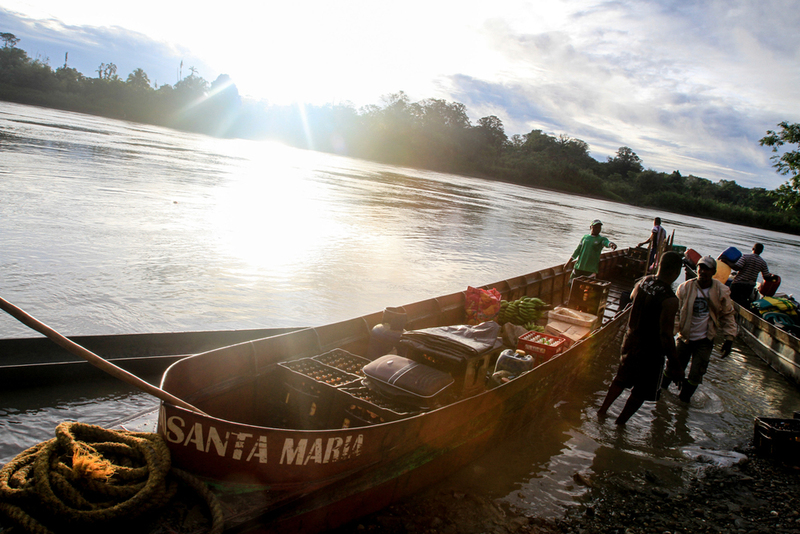 Almost at the end of the San Juan River, a small village is home for no more than 10 families and is one of the villages where the ELN guerrilla group has influence. Chocó, Colombia. 2013. Heavy armed National Police members patrol one of the last outposts they have before entering ELN and FARC controlled areas. Chocó, Colombia. 2013.